June 21, 2018 (BOSTON) — In the spring of 2017, Jumpstart partnered with Transforming Education (TransformEd) on a pilot study to identify and test out new tools to better assess our program’s impact on children and volunteers’ social–emotional skills. Strong social-emotional skills help young children understand and express feelings, relate to adults and other children, and resolve interpersonal conflict — all skills that benefit children in kindergarten and beyond. And for our college student volunteers (also known as Jumpstart Corps members), strong social–emotional skills support success in college and throughout their careers. As a result of the pilot study, Jumpstart has begun to use a nationally–normed social–emotional assessment tool for children, called the Devereux Early Childhood Assessment (DECA), and has added a new set of questions to our pre– and post–service survey of Jumpstart volunteers. Initial results are very promising. At the end of the 2016-2017 school–year, Jumpstart children were two times more likely than those in the nationally-normed sample to receive scores in the strength range (the highest range of scores) on the DECA’s three assessed skills: initiative, attachment, and self-regulation. And, on average, Jumpstart Corps members demonstrated that they believed that their intelligence can grow with effort; that they are capable of managing their behavior, emotions, and actions; and that cultural diversity is a strength. We also found that returning volunteers — those who have served two years or more with Jumpstart — reported higher self-management scores than first-year volunteers with less exposure to the program. 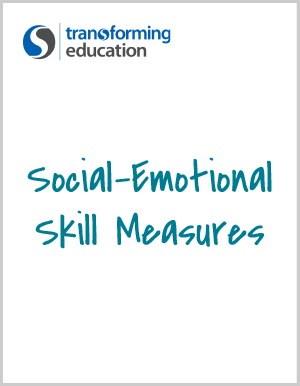 We continue to explore the best ways to support the growth of social-emotional skills in young children and adults. In the 2017-2018 program year, the pilot was expanded to include more sites, and the additional survey questions were administered to all members (both before and after service). For more details on the results of our pilot study and partnership with TransformEd, we invite you to read the executive summary of the report here.